The Lexus IS 250C reaches U.S. showrooms in June. 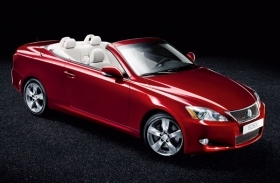 TOKYO -- For Lexus fans who cant afford the sleek SC convertible -- or cant wait for its long-overdue model change -- Toyotas premium brand is rolling out a new entry-level IS pop-top. The Lexus IS 250C, which debuted today in Japan, reaches U.S. showrooms by early June. Lexus expects global sales to reach 1,600 units a month, with about 70 percent of the shipments going to North America, said Toyota spokesman Hideki Homma. Toyota Motor Corp. last week announced prices for the new IS convertible. The IS 250C has a base price of $39,365, and the IS 350C is priced at $44,815. The only other convertible in the Lexus lineup is the SC 430, which hasnt had a major model change since its 2001 debut. The SC 430 starts at $67,680 stateside, including shipping. Through April, U.S. sales of the SC tumbled to 310 units from 860 last year over the same period. The IS 250C has a 2.5-liter V-6 engine, compared with a 4.3-liter V-8 for the SC. The United States is expected to get an option for a 3.5-liter V-6 as well. Nishiyama said another difference is that the IS has comfortable room for two passengers in the rear. Nifty perks include a hard-top roof that opens in 20 seconds and front seats that slide forward and fold over with the touch of a button to allow rear-seat access.